If you have a solo 401k, also known as a self-employed 401k or an individual 401k, and the plan’s assets as of December 31 last year exceeded $250k, you are required to file a Form 5500-EZ with the IRS before July 31 each year. If you dread another tax form, relax. Form 5500-EZ is very easy to do. My plan is with Fidelity. I received my Retirement Plan Annual Valuation Statement from Fidelity last week. With the information from Fidelity, I completed Form 5500-EZ in less than 5 minutes. Besides the usual Tax ID, name, address and phone number entries, Form 5500-EZ asks about the plan’s assets at beginning of the year, at end of the year, and the total contributions during the year. As far as the numbers go, that’s it, very simple. I get those numbers from the annual valuation statement from Fidelity. For money contributed in one year for the previous plan year, you can either count it in the year it was actually contributed (the “cash method”) or you can count it on the form for the previous year (the “accrual method”), but once you pick a method you should stay consistent with that method from year to year. To me the cash method is easier because it matches the report from Fidelity. 3D = Pre-approved pension plan – A master, prototype, or volume submitter plan that is the subject of a favorable opinion or advisory letter from the IRS. That’s it. 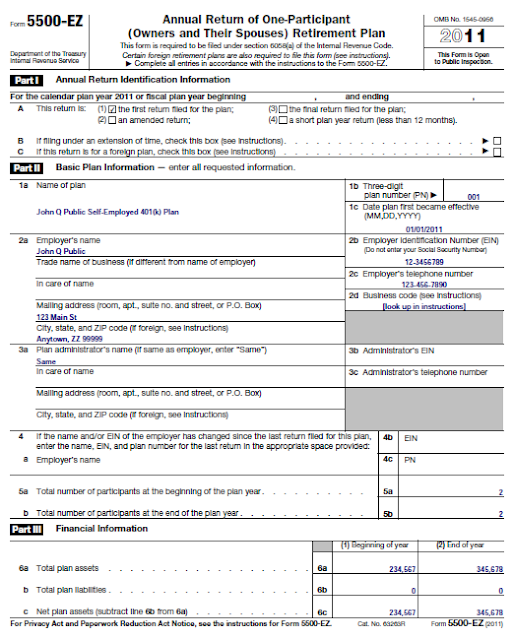 Form 5500-EZ is really easy, but you have to remember to file it. The deadline is July 31 each year for calendar year based plans. If you forget, the late filing penalty is $25 per day up to $15,000! Use Certified Mail and keep proof of mailing. The biggest advantage of a Solo 401k is that it allows employee contributions in addition to employer contributions whereas the SEP IRA only allows employer contributions. This is more important if your self-employment income is under $200k or so. If you are not earning big bucks from self-employment, Solo 401k is the way to go. If you are earning big bucks from self-employment, Solo 401k still helps you with Backdoor Roth. The last paragraph of this article was the best. Do you have an article that compares SEP IRA’s to Solo 401(k)’s based on who can contribute, how much, fees to set up each plan, and best brokerage to use for each? bn – No, but I can write one. Before I write one, read this by CPA Mike Piper: SEP vs. SIMPLE vs. Solo 401(k). Solo 401k is usually the best. Use Vanguard if you don’t need to rollover an existing SEP-IRA into it. Use Fidelity if you do. I’ll be glad when I have to worry about the 5500-EZ filing requirement. Thanks for the link to Mike’s article. I read his blog regularly too but seemed to have missed that one. Out of curiousity – how did you even know that Form 5500 was required? Vanguard is more obscure about it. It only vaguely mentions “Requires filing with IRS” on its compare plans page. Part 1 A – box 4 is confusing. Do you have to file this if the plan is < 12 months old, which it would be in the first year of the plan? Or only when the balance exceeds $250K? Mike – You have to file this whenever the end-of-year balance exceeded $250k. It could be the first year, the third year, or the last year. The boxes in Part I, line A are just additional information. If it’s the first time you ever file this for the plan, check box (1). If it happens to be a short year (first year and you didn’t make the plan effective Jan. 1, or the last year before termination), check box (4). If none apply, don’t check any boxes. I stopped trying to navigate IRS/DOL guidelines on my company’s retirement plans a few years ago and I am so glad that I did! I hired a professional to do it and I recommend the same for anyone else trying to run their own business and administer their own plan. The mistakes that you can make and the time wasted fixing them is not worth it. I found an administrator to be a great value and appreciate all of the help that they have provided my company over the past two years. Thanks very much, this post saved me a lot of time! I REALLY appreciate your list of the applicable characteristic codes. Very helpful. I have a question, I have solo 401k/KEOGH paired plan Profit Sharing/Money Purchase plan with total assets at the end of last year 248K. I did not contribute last year as I have become employee of another corporation. I would like to file final 550-ez and roll over the money to regular IRA. Do I need to file one 5500-ez for both plan or separate 5500-ez for each? I don’t know whether your paired plan is set up as one plan or two. Do you have separate plan numbers? You file a 5500-EZ for each plan number. Very helpful info! If I have a solo 401k that has <$250,000 for my self-employed side job, I understand there is no need to file 5500ez. If I also have a 401k for my work as an employee in my regular full-time job, does the value of this 401k also get added for meeting the $250,000 threshold? Or are they completely separate plans even though they are "401k's" and I just need to cross the $250,000 line with the solo 401k one to be required to file 5500ez? Thank you! Good to know that it is the balance of the solo 401k only that matters. I have a solo 401k, but it has less than $250,000 so I have not filed a 5500EZ yet. I am ending my solo business and will be closing my solo 401k. Since the 401k has less than the reporting threshold, my understanding is that I would still have to file the form this one time because it is the last year of the plan (when I close it and withdraw all the amount so it ends at $0). Should I check in Part 1A of the form that it is both my first and final return filed for the plan (both boxes 1 and 3)? Technically I have not filed for it before, so it would be my first and last time, but wanted to check with you how to go about it. Appreciate your help! Thanks – so would you check both boxes since it is the first time filing the form and also corresponds to when all the plan’s assets were distributed? Or just box A(3) for closing of the plan in the final year? Harry, I have had a single K for several years, which I ended Nov 2017 and rolled over to an existing IRA, the ending balance was less than 100k. The single K sent form 1099-R to the IRS and the IRA receiver sent form 5498 to the IRS. Do I still have to do a 5500 EZ “Final return filed for the plan”, which is part 1 box A3? Yes you do! That’s something often missed when plan assets never exceeded $250k. Hi, I submitted FINAL form 5500-ez with form 140704 and $500 (balance was under 250K ) . IRS has sent letter saying “We received your payment with form 114704. Our records indicate fee was paid for 5500ez. No other action will be taken on these accounts”. Do I assume now, that I can transfer these funds from profit sharing/money purchase accounts to my personal regular IRA/retirement accounts? and close old accounts. I terminated a profit sharing plan (single participant but it included my brother and I as partners in the business) in 2018. Our termination letter stated that we were terminating it as of 12/31/2018 but we transferred the funds to IRAs in November. When filling out 5500 ez do I check off short plan year (since funds were moved before the end of the year) or not, AND on line 5b would the number of participants at the end of the plan year still be 2 or should it be 0 since the plan was terminated? Sorry I don’t know the answers to your questions. The IRS instructions on plan termination say you should distribute assets from the plan after the termination date. If you had done that, the answers to those two questions would be very clear. We followed the recommendation of Fidelity Retirement Services that suggested that often funds can be distributed out before the plan expiration date. Since that plan expiration date was strictly something I wrote in a letter to myself and my brother I suppose I could just write a new letter dating the termination to just before we transferred the funds out. In that case I guess I would also check off short plan year and participants at end of plan year would be 0? You seemed to say the answers would be clear in that case. Before the assets were distributed, you still had two participants in the plan.